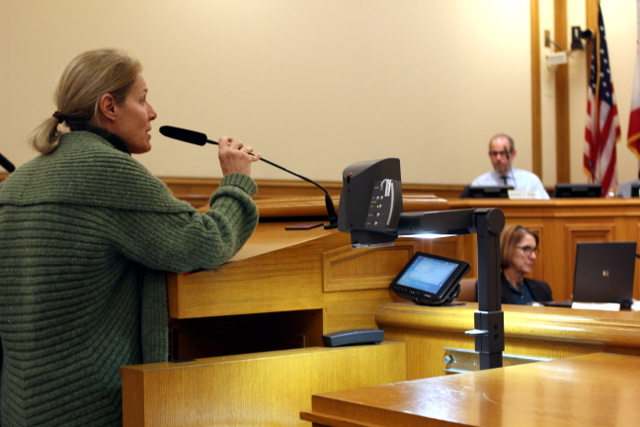 At a public meeting on Tuesday, the San Francisco Municipal Transportation Agency’s Board of Directors decided to make permanent City Hall’s 18-month pilot program regulating private shuttle companies, many of which carry tech-sector workers from their fog city doorsteps to their desks in Silicon Valley. The board’s decision was unanimous, despite widespread criticism from the meeting’s attendees. SFMTA staff are still tweaking the program in an effort to cut down on how much the shuttles impede public transit, cyclists and pedestrians, officials said. The city’s pilot program originally required private shuttle companies to pay a flat daily fee for every public bus stop they used for picking up or dropping off passengers. That will continue, though SFMTA staff are now recalculating how much the agency should raise that fee to pay for an expanded, permanent program, said Tom Maguire, who directs that program. Shuttle companies currently pay $3.66 for the day’s use of a single stop. Higher fees would cover the cost of hiring new staff to catch scofflaws and collecting better GPS data for tracking shuttle behavior. The fees will also pay for installing more prominent placards identifying the specific bus stops where shuttles are allowed to touch down, as well as any other associated construction work. As part of the new program, some companies will now be allowed to use the stops free-of-charge if they allow members of the public to ride for free. Maguire said that this would help nonprofit organizations, which had complained that they’d had trouble paying the fees. And to reign in pollution, all shuttles will have to be 2012 models or later. On Tuesday at City Hall, the room’s roughly seventy seats were filled to capacity before the meeting had even begun, and the grumbling newcomers stalked to another room to watch the meeting on television. No surprise there: The commuter shuttles, dubbed “tech buses” by their detractors, have been controversial for years. Many people had likely come in response to a call to arms circulated on Facebook by Cynthia Crews, activist for the Coalition for Fair, Legal and Environmental Transit. That group has sued the city, arguing that its shuttle-regulating program violates state traffic and environmental laws. The Facebook post urged people to show up and comment at the meeting, saying “Your testimony is vital to the public record and future legal action.” It then directed people to demand that the city gather comprehensive data about the shuttles’ environmental impacts, which the shuttles would then have to pay for mitigating. Indeed, public comments included requests that the city conduct a full environmental impact report — the board ultimately disagreed, exempting the program from that review. Some attendees praised the shuttles for making it easy to live in a city they loved. One woman, who said her name was Cori Camdon, said she regularly rode shuttles to work. “I would definitely have to drive if I didn’t have this.” It was the same thing that Supervisor Scott Wiener had said early in the meeting, in an impromptu appearance, to defend the shuttles as helping preserve air quality. But most people complained that the shuttles were a persistent nuisance in their neighborhoods, making commutes difficult for cars and bikes. People also said the shuttles blocked Muni buses from pulling into their designated stops. Theresa Flandrich spoke during public comment at Tuesday’s meeting. 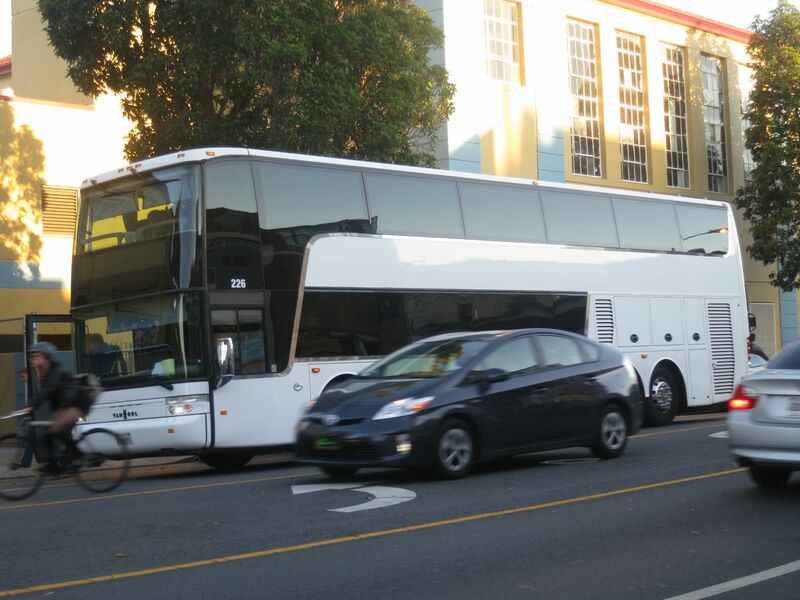 “I saw four of them on one corner within a 10 minute period, at Van Ness and Union,” said North Beach resident Theresa Flandrich, referring to the shuttles. In another instance, Flandrich said, she saw three shuttles parked back-to-back along Van Ness Avenue, making it impossible for the 49 bus to offload its passengers at the public bus stop. Alice Bierman, who lives in the Mission District, said that when the shuttles park near Mission High School they can force the 33 bus to let off its student passengers mid-block, in the street. These comments challenged SFMTA’s findings, published in an October review of the program, which found that private shuttles blocked Muni buses from pulling into their stops in only 2.7 percent of observed cases. System-wide, this caused a cumulative delay of 83 minutes per day, the review estimated. Flandrich and others questioned those findings, because SFMTA had studied only a fraction of all bus stops. But Maguire said his staff had focused on the stops that received the most commuter shuttles. SFMTA will decide how high to raise its fees before the end of the year — and the potentially better program might result in fewer disgruntled residents. Only in backwards-land would mass transportation be the subject of scorn and protest.